4,000 Regional or Premium Bands. 6,000 Regional or Premium Bands. Bill Dayton Big Band Maryland Variety Bands. The Bill Dayton Big Band has been performing since 1972. New York Minute New York Variety Bands. We have been serving the industry for the past 10 years. Face The Music Booking Agency Massachusetts Variety Bands. We have been in business for over 15 years. BRAVO Entertainment Productions, Inc. Texas Variety Bands. BRAVO! Entertainment has been providing Top entertainment for 10 years. BRAVO! has won numerous awards for entertainment production locally and internationally. With BRAVO! Entertainment you will recieve the service and the top entertainment that you demand. All Time Favorites Minnesota Variety Bands. Since 1982 We have helped over 300,000 clients connect up to anything they need for events, nationwide. Pizzazz Jazz Minnesota Variety Bands. Pizzazz Jazz is a two year old band with 20 years of expierence. Pizzazz Jazz is formed from another band. This gave us the music, equipment and mostly the talent to be very professional right away. The players have all been together in a variety of other groups before so, we have a great blend in Pizzazz Jazz. Check Pizzazzjazz.com to see the extraordinary bios of the players. Brian Harrell Entertainment and Events Minnesota Variety Bands. 25 years as an entertainer, singer and performer. Very good at working with all ages and types of music. Blue Breeze band (Soulful R&B Motown) California Variety Bands. I have been performing music for over 30 years. I have been a band leader for the last 10 years. I have been playing the guitar for 35 years. Party Makers USA Massachusetts Variety Bands. Boston Party Makers have been providing entertianment services since the early 80's and under current ownership since 1989. Rhythm Edition band Arizona Variety Bands. The Rhythm Edition has been performing in the valley for the last 23 years, we have had the opportunity to perform in front of over 40,000 people large festivals, many weddings and large corporate party's to some of the hottest dance clubs in the valley, we have traveled to surrounding states. We have opened for acts like, Grass Roots, Turtles, Stepin Wolf, Beach Boys, Marshal Tucker band and more. This is one band you don't want to pass by. The Fusion Band Inc Florida Variety Bands. We have been in business 10 years serving the region with premier entertainment. Squeezebox Ohio Variety Bands. With over 60 years combined experience between the core members of the band, we're able to accommodate nearly everyone's requests at our performances, and strive to please everybody in attendance, both on and off the dance floor! ADEL MUSIC & ENTERTAINMENT California Variety Bands. Adel Music & Entertainment has provided our services since 1980 (over 23 years). New Attitude Productions Florida Variety Bands. over 30 years experience We pretty much do it ALL! : Top 40, pop, Latin, Disco, Motown, Rock & Roll, R & B, Swing, Jazz, Country, Calypso...every song we do is true to the feel of the original recording! Your favorite music, just as you like to hear it. Ian Gallagher New Jersey Variety Bands. Ian Gallagher has been performing traditional Irish songs and American pop tunes for the past thirty-five years. Ian Gallagher it is not your typical Irish singer He is in fact a sort of crooner, with a clear jazz sensibility A very fine voice deeply imbued with his Irish roots.The Band showcases Irish songs and instrumentals, as well as 1950's American pop standards. The Doubletake Band Maryland Variety Bands. The Doubletake Band: Pleasing Crowds for Over Three Decades The Doubletake Band�the name is new but this group has been real crowd pleasers for over three decades. Like the saying goes, you get out of something what you put into it. Well, these hard-singing, hard-playing rock and soulsters have been walking the walk since they began performing at junior high school proms. They�ve called the Maryland suburbs home and built a solid reputation as a group that delivers a solid sound every time out. Members of The Doubletake Band perform a wide variety of music that brings back the good old days when even AM radio played �the good stuff.� Growing up in the 1960s, they were introduced to a wealth of musical influences�rock, soul, country and blues. As teenagers, they developed proficiency on their chosen instruments of guitar, bass and drums. They played high school dances, pool parties, backyard barbecues, and officer�s clubs or just about anywhere that good rock and roll and soul music was appreciated. Eventually they were performing in nightclubs, on cruises, at outdoor festivals, touring the East Coast and getting involved in studio recording projects. While bands come and go and musical tastes change, The Doubletake Band has remained true to their roots of rock and soul. That�s what they grew up listening to�the Beatles, Chuck Berry, Elvis, Wilson Pickett, James Brown and Creedence Clearwater Revival. This is classic baby boomer music that�s in demand today as much as ever and will never go out of style. There are no electronic enhancements or canned instrumental tracks used in their live performances. What you see is what you get. And that�s why The Doubletake Band is the real deal. If you�re a child of the 60s, they play the soundtrack of your generation. Listen to them perform a Jimi Hendrix blues rave �Red House;� rock to CCR�s �Fortunate Son,� take a soulful ride with Wilson Pickett�s �Mustang Sally,� or move with a lively Latin flavor of Santana�s �Evil Ways,� and there�s no doubt that The Doubletake Band have got those bases covered. The Doubletake Band is just like the name sounds. After hearing them, you�ll want more. Once is never enough! Check out their latest CD that features their versions of rock and soul classics that ably demonstrates that like a fine wine, some music does get better with age! THE PICTURES BAND Texas Variety Bands. The Pictures band has been performing for a solid twenty years. This gives the band not only an incredible sound but shows that they also give dependable and relaible service. 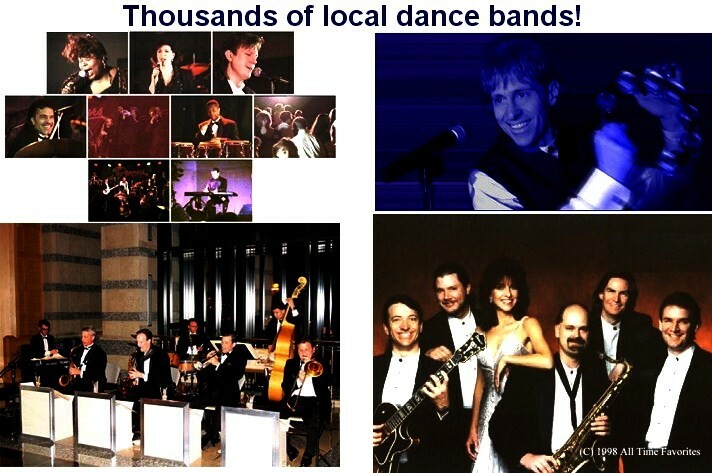 We make it easy to find a Variety Dance band for your wedding.